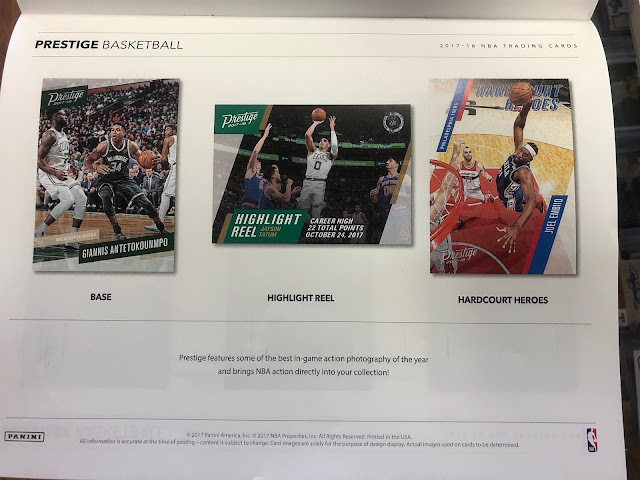 2017-18 Prestige Basketball is offered exclusively to Panini America Round Table Brick & Mortar stores for national distribution on Wednesday February 21st. NEWS FLASH: Sports Cards Plus, a.k.a. 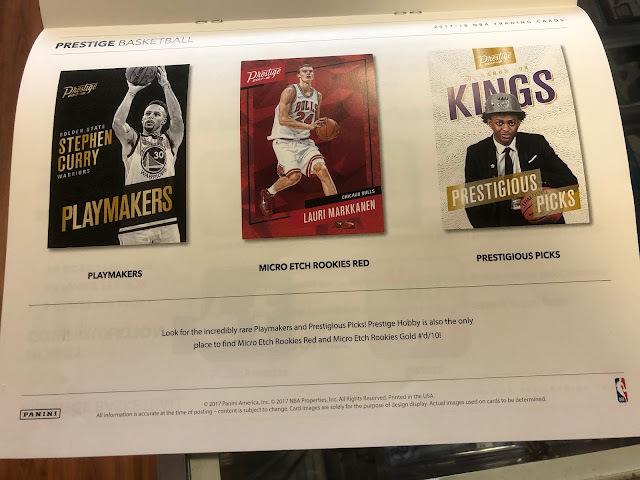 The Super Hit Factory has been selected to be one of just a few to participate in the "Sneak Peek" of 2017-18 Prestige Basketball THIS FRIDAY, February 16th, a full 5 DAYS BEFORE NATIONAL RELEASE. Sports Cards Plus will celebrate this event with contest prizes and free packs. Buy a box of 2017-18 Prestige Basketball and get a FREE Entry to our "Prestige Sneak Peek Drawing" on February 21st. The more boxes of Prestige you buy the more chances you have to win. 1. Grand Prize $100 Credit to anything in our store. 2. Second Prize $50 Credit to anything in our store. 3. Third Prize $25 Credit to anything in our store. 4. Fourth Prize (3 Winners) get one FREE Panini VIP Party Gold Pack. Below is information on 2017-18 Prestige Basketball. 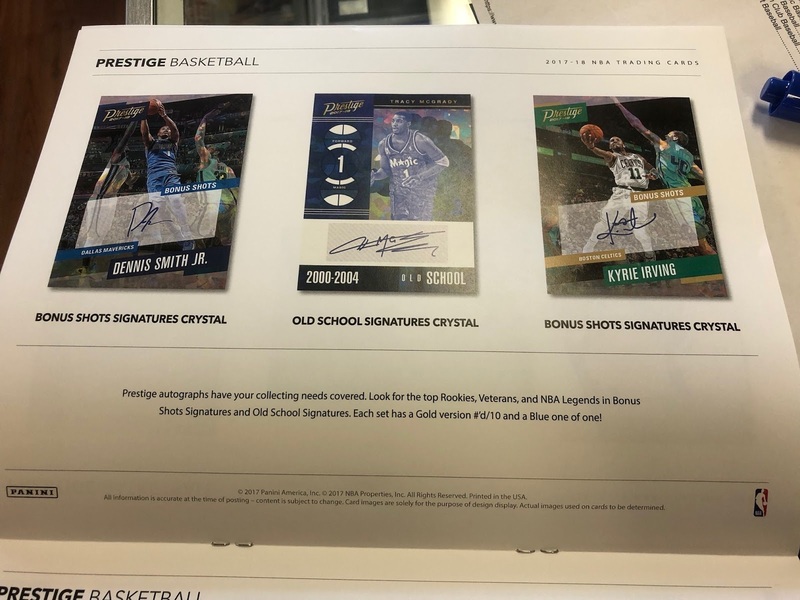 · Autographs include: Kobe Bryant, Kevin Durant, Kyrie Irving, Magic Johnson, Tracy McGrady, Gary Payton, Lonzo Ball, Markelle Fultz, Kyle Kuzma, De’Aaron Fox, Jayson Tatum, Zhou Qi and more! o Fall approximately 7 per box! o Playmakers and Prestigious Picks—showcasing the top NBA veterans, and rookies from NBA Draft 2017! o Base/Rookies Crystal, Base/Rookies Crystal Gold #’d/10, Base/Rookies Crystal Blue #’d/1, and Crystal, Crystal Gold #’d/10 and Crystal Blue #’d/1 of the following—Rookie Class, Highlight Reel, Stat Stars, Stars of the NBA, Hardcourt Heroes, All-Time Greats!